Grease mini heart shape/donut pan with cooking spray or melted butter and set aside. In a medium mixing bowl whisk sugar and lemon zest until moist and fragrant. Crack in the egg and give it a quick whisk till combined before adding the yoghurt and mixed well. Next sieved in flour, baking powder, salt and whisk together with melted butter till the mixture resemble paste like texture. Spoon mixture into disposal pipping bag, snap off the tip and pipe into prepared trays at about 3/4 full. Bake in preheated 180 degree oven for about 8 - 10 minutes or until donuts spring back when touched. Cool donuts in pan for another 2 - 3 minutes before removing it from tray. 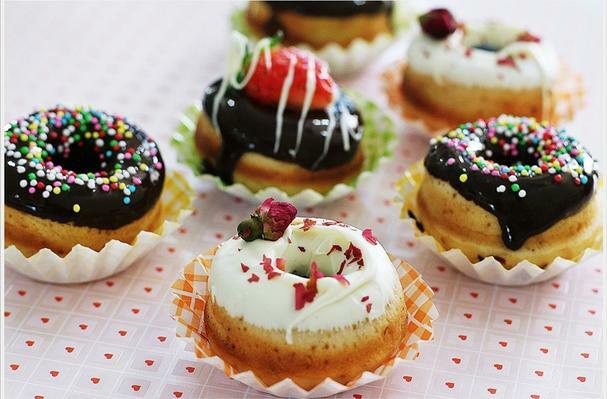 Decorate the donuts with melted chocolate, sprinkles, fresh fruits or etc. These heart poppers are great and quickly to make. Excellent!